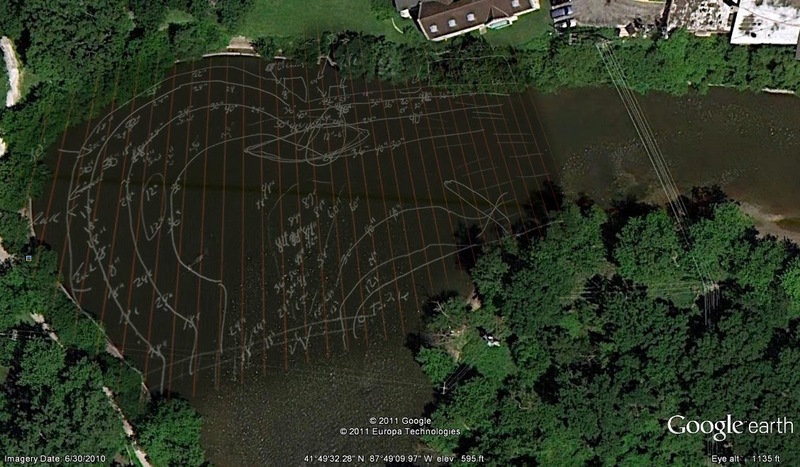 My good friend Dan Sims just posted a video on my personal Facebook from way back in 2011 - October 26th to be exact - when we decided to map out a section of the Des Plaines River in Riverside. It was a rather rudimentary first attempt at topography for the both of us but surprisingly effective. 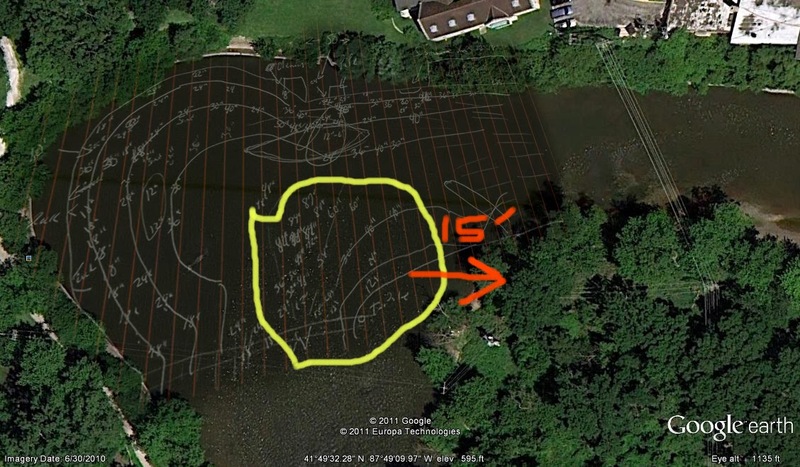 Essentially, I probed the area in a grid pattern from the kayak and would shout different measured depths. Dan would record those findings and eventually, we created a rough map. Once we did that, I was able to superimpose that map onto an aerial view of the area we were mapping. When it was all finished, I was incredibly surprised at how accurate it was. I went back a few weeks later with a printed copy and was actually able to verify most of what was on the paper. The main exception is the lower right corner of the map...all of those depth contours are about fifteen feet to right. As rudimentary as it sounds, we actually learned quite a bit about a spot we had both fished many many times before including the discovery of a rather large hole that was more than eight feet deep!! I also realized that afterwards, I didn't really need the map anymore because I had pretty much memorized where the holes were. Even now, I have a pretty good recollection of them all but I figured its time to share with the rest of the world! So, if you ever find yourself fishing "the bend" in Riverside, here's a map that might help you discover a hole you never knew. Very cool!!! Thanks, for sharing the map with depths! I have never fished that section of the river before. That fits with my internal map of the area, but I didn't fish there at all last year and I'd be curious to know how it's changed since the dams came out and (more dramatically) the massive flooding of last spring. I wouldn't be surprised to find it's reconfigured itself quite a bit. I fished it through last summer and it hadn't really changed much. Last year wasn't bad for flooding but this year will be a very different story. Last year wasn't bad? Wasn't it last year that Brookfield and Riverside were underwater in April and I was jealous watching people canoe down Brookfield streets, while my canoe was sitting unused in Wisconsin? Some rivers that I know well were completely changed, with truck-sized boulders moved, islands erased, new islands created, whole new channels carved. Obviously that didn't happen in Riverside, but I would have thought there'd be some scouring and rearranging. Actually was hoping some silt and sunken junk would be washed out of that bend. I don't think so. I don't know how it could have been. We had no snow. Maybe the year before? Maybe I blocked it out of my memory? I thought I remembered you writing about it! The Vermillion River near Oglesby is normally at 4-7ft on the USGS meter, but it broke 40ft during the flood. Some of my favorite holes moved or were eliminated. The crappy part about mapping a river is one fallen tree and a flood later and it is totally different.